Composed by Traditional. Arranged by Miranda Wong. Children's Music, Movies/TV, Christmas, Pop, Wedding. 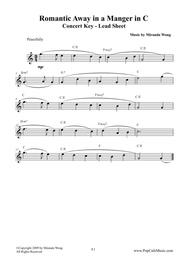 Lead Sheet, Solo Part. 3 pages. Miranda Wong #MS00367. Published by Miranda Wong (S0.9706). New Melodic Arrangement for Away in a Manger. Suitable for Wedding. 2 Pages. C Key with Chords.